We manufacture and offer different types of Fresh Air Duct Ventilation Systems for industrial as well as commercial establishments. As fresh air is a must for indoor ventilation, and so is the need of extensive Dust work to check air pollution. We manufacture robust, cost effective duct systems that are easy to install and can be tailored as per the buyer’s specifications. We Blow Tech Engineers offer a Fresh Air Ventilation Systems for indoors. These are used for total De-humidification by applying fresh air with ducting, grills and blowers. The extensive duct-work is done for most air pollution technologies. 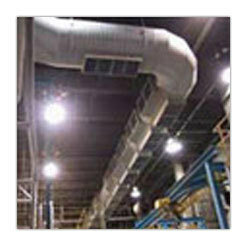 We provide rugged, cost effective and durable duct-work. Our duct-work is custom made to match your specifications and we can also design a duct system to correspond with the already existing system in your facility. We provide various accessories like dampers to include with the duct system for better cross ventilation indoors.